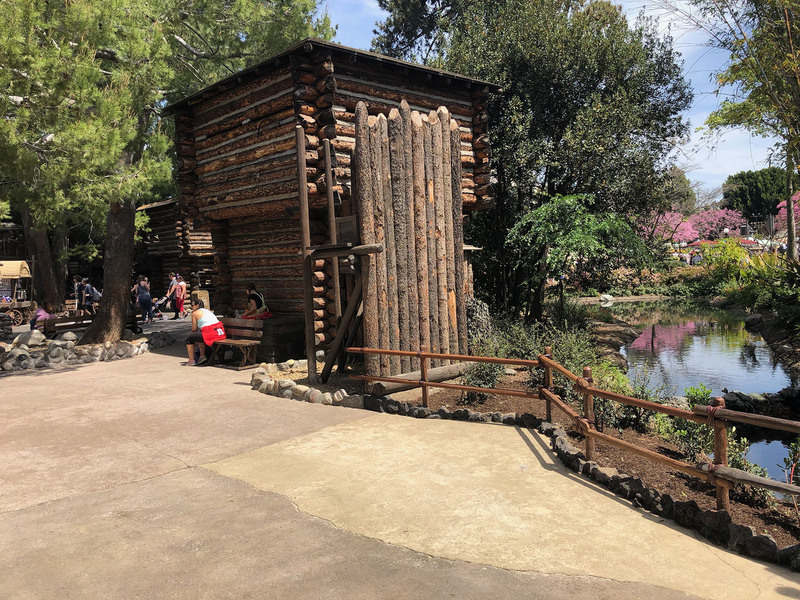 The week of April 14–22 is expected to be the busiest of the spring break weeks at Disneyland, though a large number of local school districts have already finished their breaks. Regardless, this is the one week that the Limited-Time Special Ticket and the Limited-Time Southern California Resident Ticket offers are blocked out, along with the lowest tiers of annual passports. This week is also the final week to purchase the fudge Easter eggs from the Candy Palace at Disneyland. As with Disneyland's famous candy canes, these fudge eggs are made fresh at Disneyland and available in limited quantities during the holiday season. 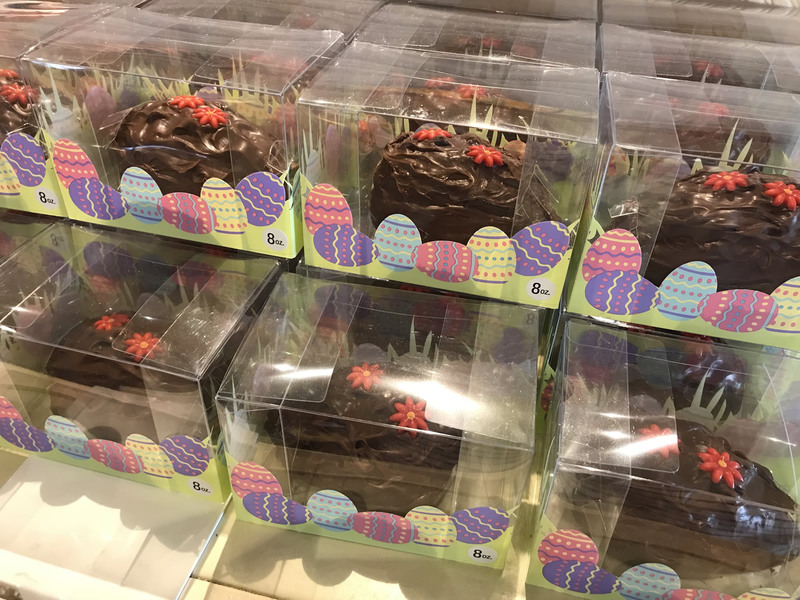 The eggs have attracted a larger following thanks to Internet publicity, but as recently as last year you could just walk into the Candy Palace and select an egg from a display full of the chocolate treats without any problem. Chocolate-covered fudge Easter eggs are the new must-have treat at Disneyland. MousePlanet file photo. Something changed this year, and the eggs are been flying off the shelves as soon as they're made each Tuesday. Unfortunately Candy Palace managers have yet to enact the same crowd control measures that are used during candy cane distribution, and some visitors have complained about line cutters and customers purchasing as many as 10 eggs at a time. There are two final Easter egg days scheduled this year—Tuesday April 16 and Saturday April 20—and we recommend arriving at park opening if you absolutely must get your hands on one. We hope Candy Palace managers put some controls, like wristbands and lower purchase limits, in place for this final week of distribution, and reevaluate plans for 2020. Storytellers Cafe at Disney's Grand Californian Hotel – brunch buffet served from 7:00 a.m. to 2:00 p.m., and dinner buffet served until 10:00 p.m.
PCH Grill at the Paradise Pier hotel – brunch buffet served from 7:00 a.m. to 1:00 p.m., and dinner served until 9:00 p.m.
Goofy's Kitchen at the Disneyland Hotel – brunch buffet served from 7:00 a.m. to 2:00 p.m., and dinner served until 9:00 p.m.
You can also splurge on the new $125-per-person Disney Princess Breakfast Adventures at the Napa Rose restaurant at Disney's Grand Californian Hotel. Limited reservations are still available for all of these options via the Disneyland website, or by calling (714) 781-3463. Finally, you can try the new brunch with the Easter Bunny at Catal restaurant in Downtown Disney. The family-style breakfast event at Catal features a photo opportunity with the Easter Bunny, bottomless mimosas for adults, and an apple cider cart for children. Each child receives a personalized Easter basket and a stuffed bunny. "One of the most complex attraction experiences that we or anyone else has ever built." That's what visitors should expect from the Star Wars: Rise of the Resistance attraction when it opens later this year inside Star Wars: Galaxy's Edge at Disneyland. Trowbridge made this remark during the "Bringing Star Wars: Galaxy’s Edge to Life at Disney Parks" panel during the Star Wars Celebration event this weekend in Chicago. Actor and Star Wars fan Josh Gad hosted the panel discussion, which included photos and video from the two attractions designed for the land, Millennium Falcon: Smugglers Run and Star Wars: Rise of the Resistance. For those who weren't in Chicago, you can watch a replay of the entire Bringing Star Wars: Galaxy's Edge to Life at Disney Parks panel via this YouTube video. MousePlanet's resident Star Wars expert Todd King will share his highlights from Celebration this Thursday. 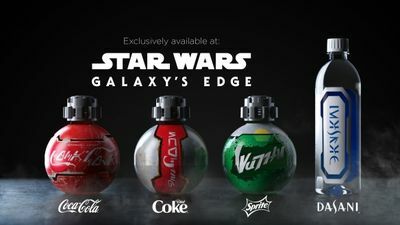 During the panel, Disney also announced it had collaborated with Coca-Cola to design custom bottles for Coca-Cola, Diet Coke, Sprite, and Dasani that will be sold only in Star Wars: Galaxy’s Edge. The bottles will features scuffed labels printed in Aurebesh, the alphabet used in the Star Wars universe. It's been nearly two years since Disney debuted the upcharge MaxPass service. MaxPass includes unlimited downloads of PhotoPass photos taken on each day that the entitlement is valid. It also allows visitors to collect and redeem Fastpass tickets remotely using the app, instead of collecting paper Fastpass tickets from a physical kiosk in the parks. When MaxPass debuted, Fastpass tickets for World of Color or Fantasmic were the only exclusions in the service, but Disney changed that last week. Visitors who purchase MaxPass, or who have it as part of their annual passport, can now select tickets to either show using the smartphone application as soon as they enter either theme park. MaxPass is still a same-day program, and users must activate the entitlement on the day they visit the park. Even better, selecting a Fastpass ticket for World of Color or Fantasmic does not prevent users from collecting another Fastpass to use earlier in the day, and users can can make Fastpass selections for either park without park-hopping. 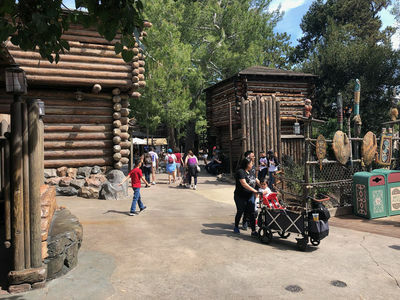 All that means a MaxPass user can walk onto Buena Vista Street, claim a Fastpass for Radiator Springs Racers in Disney California Adventure and book a Fastpass for Fantasmic in Disneyland. This change is likely another of the updates due to Project Stardust, and will help keep some unnecessary traffic away from the Rivers of America area. If MaxPass users can book a Fantasmic Fastpass from their phones, they don't need to join the Star Wars crowds heading towards Frontierland to collect a paper ticket from the Fastpass machines. Of course, we expect Disney to relocate the Fantasmic Fastpass distribution as far away from Galaxy's Edge as possible to further reduce traffic on the west side of the park. As we published in March, Disney will also soon roll out a new recovery process for the MaxPass offering. Under the current system, Fastpass users who discover their ride is closed during their assigned return window are permitted to use their Fastpass ticket at the same attraction once it reopens that same day. While this may mean Fastpass users will have a longer-then-usual wait once the ride reopens, cast members can adjust the ratio of Fastpass versus standby riders to keep the line moving. Both the Disney Gallery and The Disneyland Story presenting Great Moments with Mr. Lincoln will be closed April 15 to 18 as Disney prepares to present a sneak preview of the upcoming live-action Aladdin in the Main Street Opera House. The preview begins Friday, April 19. We expect the current exhibit of artwork and props from Dumbo will give way to displays from the new film. Aladdin opens in theaters on May 24, 2019. In January and March, we detailed some of the preparations Disney managers are making in advance of the opening of Star Wars: Galaxy's Edge. Disney has code-named these operational and physical improvements "Project Stardust," and is racing to complete as many as possible before the May 31 grand opening of the new land. One of the recently announced projects was to completely eliminate the curb along the outside ring of the Central Plaza. The portion in front of Sleeping Beauty Castle is now complete, with work continuing on the west side of the plaza. Disney hopes to have the west half of the plaza completed by summer 2019, and to begin work on the Tomorrowland side in winter 2020. The curb in front of Sleeping Beauty Castle was replaced with a sloped grade to street level. Photo by Todd Pickering. One project that will take longer than hoped is a planned widening of the bridge at the Adventureland entrance. Officials say it was more difficult than anticipated to remove the alcove on the bridge and replace the sign, but they are hoping to complete the project by June. 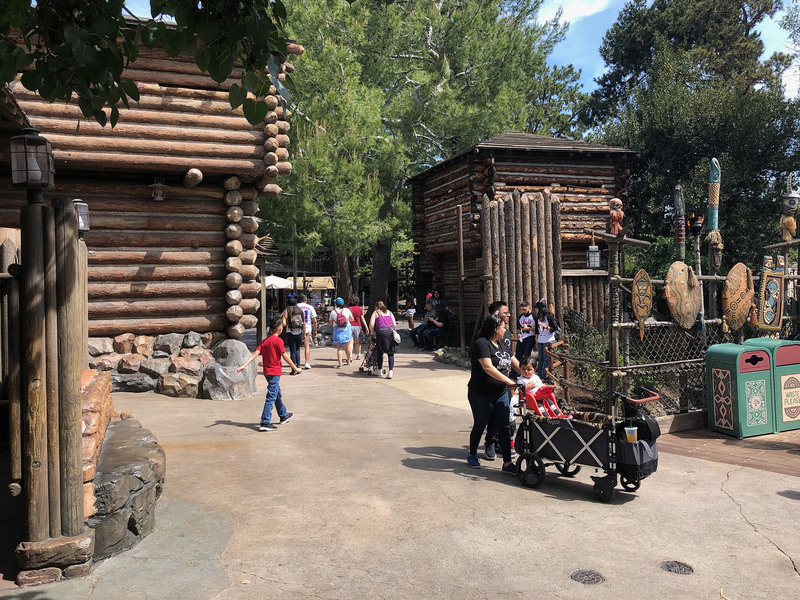 However, the walkway between Adventureland and Frontierland reopened last week, with planters and a portion of the fort wall removed to widen the path. Fresh concrete shows where planters were removed to widen the walkway between Frontierland and Adventureland. Photo by Todd Pickering. 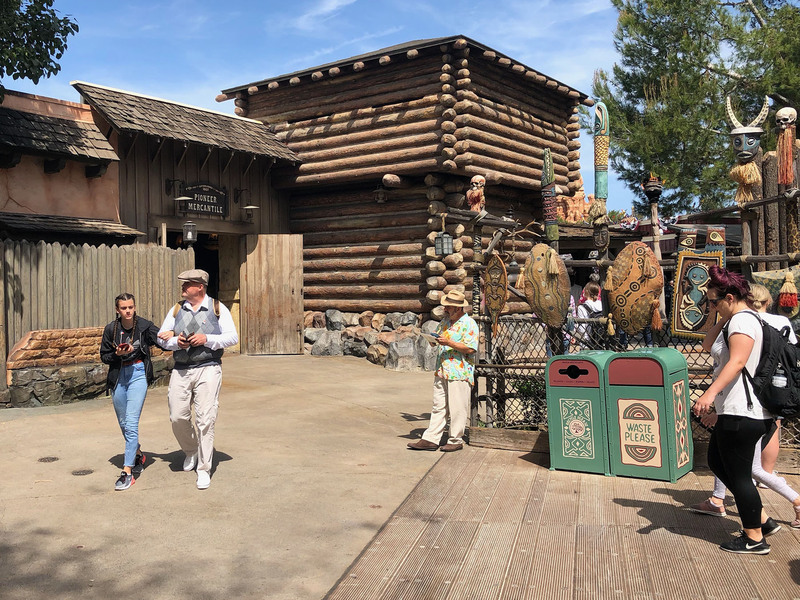 The transition from Adventureland into Frontierland is wider following a Project Stardust makeover. Photo by Todd Pickering. A section of the fort wall was removed to widen the walkway from Adventureland into Frontierland. Photo by Todd Pickering. 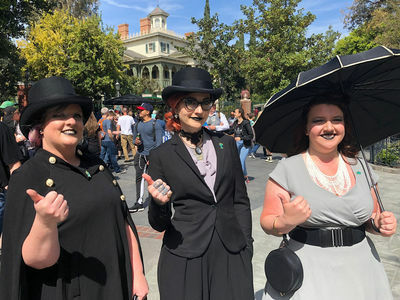 ...The Dapper Day Spring Outing to Disneyland took place this weekend, and MousePlanet's Todd Pickering spent the day with the well-dressed crowd. He posted dozens of his favorite fashions to the MousePlanet Instagram page, so be sure to check out all of the stunning ensembles. (L to R) Jennifer Kreitzinger, Jessica Warren and Erin Cuevas came out to socialize during Dapper Day at Disneyland. Photo by Todd Pickering. ...The Astro Orbiter in Disneyland's Tomorrowland is scheduled to reopen today, April 15. The Disney Gallery – closed April 15 - 18 for refurbishment. The Disneyland Story presenting Great Moments with Mr. Lincoln – closed April 15–18 for refurbishment. Casey Jr. Circus Train – closed April 29 through May 23 for refurbishment. Storybook Land Canal Boats – closed April 29 through May 23 for refurbishment. Minnie's House – closed April 29 through May 3 for refurbishment. Alien Pizza Planet – closed May 13 through 23 for refurbishment. Fairy Tale Treasures (shop) – closed May 15 through 23 for refurbishment. Bibbidi Bobbidi Boutique (shop) – closed May 15 through 23 for refurbishment. 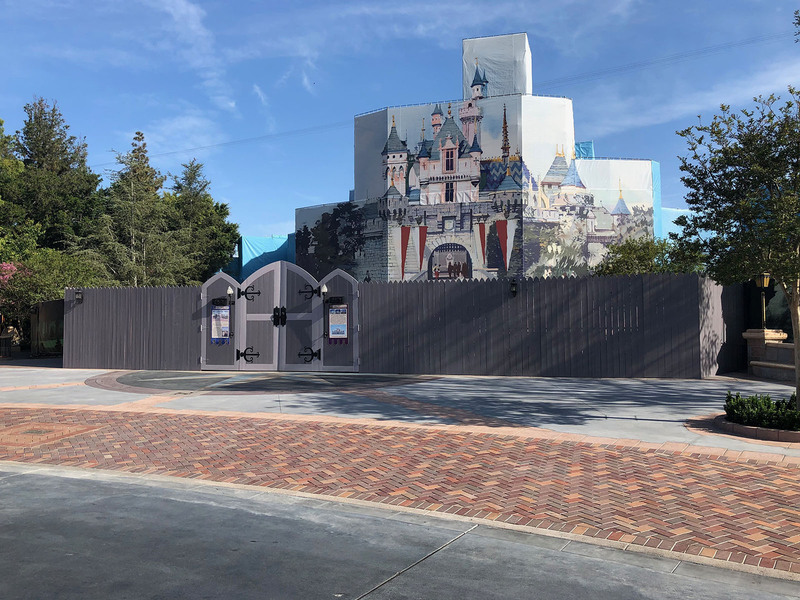 Sleeping Beauty Castle Walkthrough – closed through at least May 26 for refurbishment. Sleeping Beauty Castle Enchanted Chamber – closed through at least May 26 for castle refurbishment. Rita's Baja Blenders – closed through April 27 for refurbishment. Silly Symphony Swings – closed through May 23 for refurbishment. Taste of Downtown Disney – Thursday, September 5. More information to come. Dapper Day Fall Outing (unofficial event) – November 3. More information on the event website.